Standard 1.25" Prime Focus T-adapter fits on any telescope that uses a 1.25" eyepiece focuser for prime focus photography. 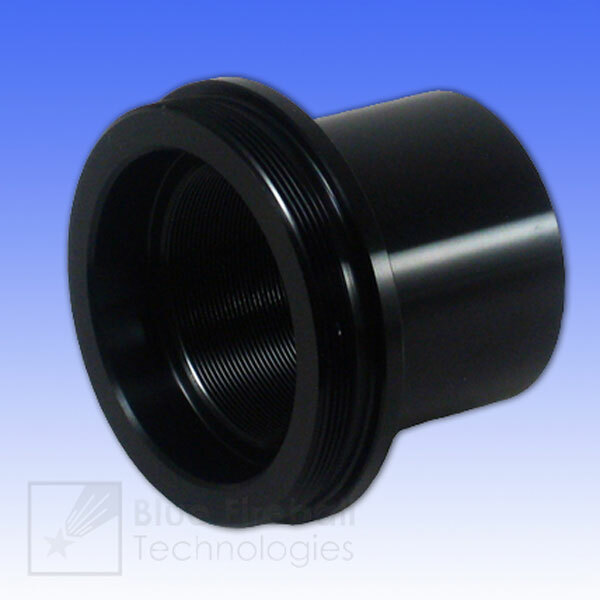 The 1.25" barrel of this adapter is threaded to accept standard 1.25" filters so you can use your favorite photography filters as well. Precision machined from aluminum and black anodized. The adapter weighs 0.9oz and its total length is 1.34" (34.1mm). The use of this adapter is not limited to D/SLR cameras. It can also be used to image with webcams and video cameras. For this, you will need to attach your webcam to the male T-thread on the adapter via a webcam-to-T thread adapter. Similarly, you can connect a video camera via a C mount-to-T thread adapter. This adapter cannot be used with point-and-shoot cameras. 5.0 (Based on 22 Reviews) 100% of reviewers recommended this product. Machining and finish are good. It fits well. Very nice, allows you to freely rotate the camera around to obtain the desired orientation rather than a straight screw on t ring connection which when snugged down arrives at a random orientation. The barrel of this T adapter allows me to mount my camera as close as possible to the eyepiece tube of my telescope and achieve prime focus without the use of a Barlow lens. Review by Rusty of Houston, TX. Using this for Astroimaging with DSLR. Works as desired, straightforward, good price. Thanks! Review by Kl of Shelby NC. Review by JHolland of Abilene. I use this for DSLR photography through a telescope that has a 1.25" visual back. It is well made and does the job fine. Review by JohnD of Spokane, WA. This is a quality product. The camera adapter part exactly fitted my Nikon D80 and the part that fits into the telescope exactly fitted into my old scope. The only problem I had with it was tightening the screws on my scope to hold it into position. This is a problem with my scope NOT the adapter. This is a well made piece of equipment and great value for money. Review by Jeff Bosworth of Altair IV Observatory - Amelia, OH. 5.0 Well Made and Does the Job! I purchased this to attach a USB filter wheel to my 2" focuser. I needed something simple that did not add to an existing back focus limitation. This adapter is well machined and anodized and works perfectly for my purposes. Review by MG of North Carolina. I chose this T-thread adapter because it is nice and compact, without the unnecessarily long barrel of certain other T-thread adapters. The aluminum construction feels very strong, yet it is lightweight, and the black paint job looks very sharp. The paint hasn't flaked or peeled yet after a dozen uses. The threads mate with the T-ring threads precisely. One con for users of certain diagonals such as the one provided with Nexstar SE telescopes: the thumbscrews on these diagonals may not fully clear the flange of this t-thread adapter, preventing it from sitting flush against the diagonal. Review by Greg of Santa Clarita, CA. It does exactly what it is supposed to do. Threads mate well with t-rings. Review by David, amateur astrophotographer of Mapleton, UT. I knew I didn't have much back focus, so I chose this adapter. It works fine, but I was right about the back focus; I don't have enough, even with this piece, but it didn't cost much to find this out. Review by Jeudy Blanco of Costa Rica. It is simple, inexpensive and does its job well. Review by AstroDr. of Estes Park, CO. This adapter is professionally-made with excellent fit and function. I use this adapter for my Baader T-mount diagonal system (I previously had used only a 2" Baader T-nosepiece on the 2" diagonal). Now I can use my 2" diagonal in my refractors which only have a 1.25" focuser barrel. I suspect it would also work perfectly for prime-focus astrophography. Review by bart of chicago. Excellent build, finish, and fit. Review by herrindude of Fairhope, Alabama. Review by Doctor Dan of Toledo, Ohio, USA. 5.0 An essential part of your kit. Anytime you use a telescope and want to preserve what you saw with your camera, you simply must have an adapter like this one. On my Meade 'scope, this inch and a quarter adapter slides nicely into my eyepiece tube, and with the matching ring to fit my Canon camera, lets me take pictures some people wouldn't believe. Review by Bill of Wisconsin. 5.0 It's nice. And inexpensive. Best price I could find. Can you believe what some people charge for threaded tubes?? Review by Baja observer of Tijuana, Baja California. This is all you need to connect any reflex camera (with their respective T ring) to any 1.25 focuser, I have use mine a lot, I like to take pictures of the moon on the focuser of my dobsonian, and the results are great. The chips of the modern cameras are so small that you do not need a 2"